At Guyhirn Tyres we repair tyre punctures to British Standards. 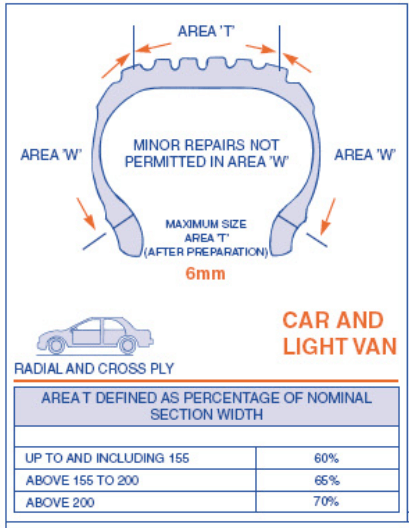 However, as you can see from the diagrams below, there are areas of the tyre that, in accordance with BS AU 159 no repair is permitted. If your tyre in damaged in the area marked W, it is advisable to contact us about replacing the tyre. We always try to repair tyres when possible. 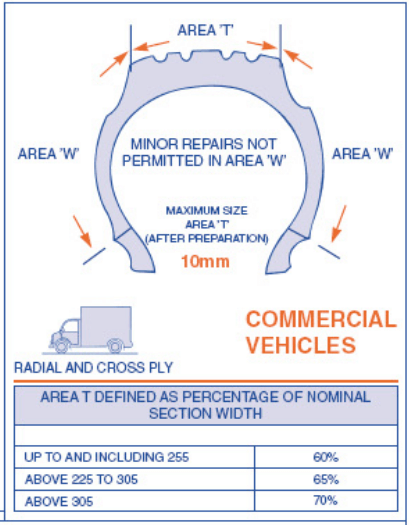 For Car, Light Van and Commercial Vehicle tyres, there is no limit to the number of repairs in area marked ‘T’ provided that no two patched overlap.